London South Bank University (LSBU) celebrated its 125 year anniversary with a reception at the House of Commons in the Palace of Westminster on 11 October 2017. 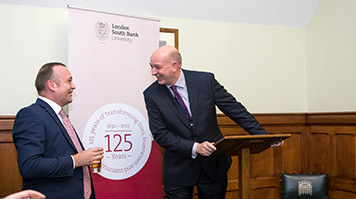 The reception was hosted by Neil Coyle, MP for Bermondsey & Old Southwark who earlier this year tabled an Early Day Motion recognising LSBU’s 'vital contribution to higher education as the University reaches its 125th anniversary'. Speaking during the reception, Mr Coyle highlighted the charitable foundations of the University and heaped praise on LSBU for its recent achievements, including being named 'University of the Year for Graduate Employment' by The Times and The Sunday Times Good University Guide 2018. Professor David Phoenix, Vice-Chancellor of LSBU, spoke about LSBU's work to increase participation in the local area. Prof Phoenix mentioned LSBU's promotion of a more collaborative approach to skills provision through its family of education providers, before proposing a toast to the University's staff and students, past and present. Attendees at the reception included former Vice-Chancellors Baroness Pauline Perry of Southwark and Sir Deian Hopkin, Gordon Marsden MP, Shadow Minister for Higher Education, Marsha De Cordova, LSBU alumna, MP for Battersea and Shadow Minister for Work and Pensions (disabled people) and Madame Hu Pinghua, wife of the Chinese Ambassador to Great Britain.